The first thing to clear up is that Heavy Metal in Baghdad is not, primarily, about heavy metal. It’s about people, and the war in Iraq and the after-effects of it. Plot-in-a-nutshell: a film crew from a US-based metal magazine travel to Baghdad (and later Syria) to interview the only Iraqi heavy metal band, Acrassicauda. We hear about their family, their music, the regimes they have lived under and finally their flight to another country. This film isn’t fiction. 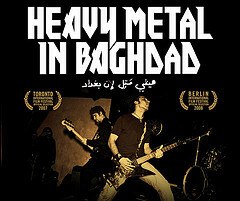 It’s a very well made documentary by two North American metal fans who travel to Iraq to watch and help host a heavy metal contest in Baghdad. The band members are interviewed about everyday life there, both before and after the war when the crew visit for a second time. Unlike many news reports, nothing is sensationalised. Plain truths are uttered, and the state of the country after the war is laid wide open to inspection. Did the conflict make any real difference to the people who matter? That is, the family on the street trying to earn a living? Judging by the fact that, at the time of the film’s release, over 2.5 million Iraqis had fled their country the answer is “no”. They’d rather live in poverty as second-class citizens than risk staying in Baghdad or elsewhere and risk persecution or death. At least they’re free – and poverty seems to be a price they’re prepared to pay. The pace of the film has been very well calculated. It begins on a high as the original crew take a jokey approach to heading there to see a concert. On their second visit, the tone is much more muted – as is the music. The band unable to play in their home country for fear of persecution. Fans can’t even headbang as it looks too much like Jews nodding at prayer! Things seem happier when the band all meet up again in Damascus, but as I mentioned they’re now all destitute. They do, however, manage to play another gig and cut a three-track demo. What really hits home is when the film-makers show them the first two thirds of the movie as a “work in progress”. The emotions are overwhelming and the film ends on a very sour note. Despite the best of intentions, things don’t always end well. But that’s the way it is and that’s why this is such as good piece of documentary. Don’t avoid it just because it seems to be about music you have no appreciation for. See it because you need to know how other people in this world are being forced to live. And then realise how damn lucky you are.